Okay, folks: you may have seen me posting about this on social media, but I wanted to take a minute to tell you all about an exciting new project I’m working on called VAST. VAST is a new Geek & Sundry series, a livestream science-fiction RPG from the mind of phenomenal writer Jackson Lanzing. The series takes place in a Star Trek-like universe, but trust me when I say we’re blazing into some new frontiers the likes of which you’ve never seen before. I’m proud to be working alongside the incredibly talented group of writers that Jackson handpicked to help him write the 12 episode first season. The first episode aired last week, and my episode will be coming up after the holiday break. 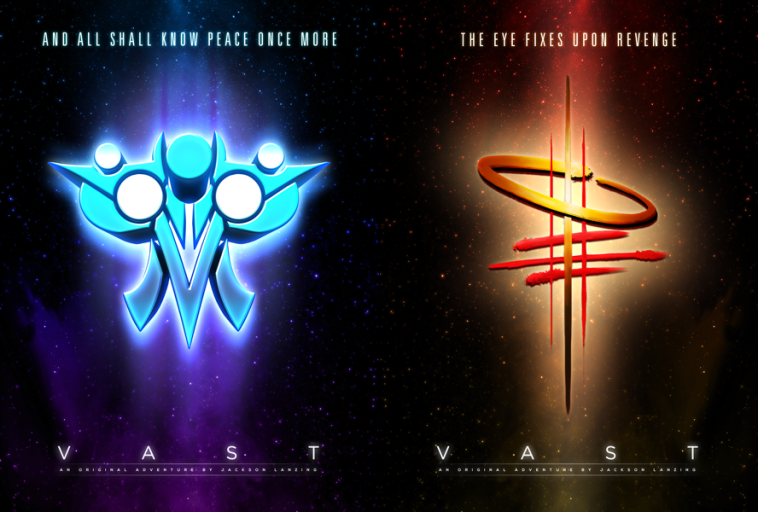 Eventually, VAST will be a Geek & Sundry Alpha exclusive, but the first four episodes will be free for everybody! When you’re done reading this post, you should have a pretty good idea of what VAST is, and how you can watch it RIGHT NOW. For those of you not too familiar with the concept, tabletop roleplaying games involve a group of players essentially improv’ing their way through adventures facilitated by a game master. Our game master and series creator Jackson created the world of VAST, and worked closely with our players to help them build characters who fit into that world. There’s a bit of dice-rolling involved that helps the GM determine the outcome of certain situations, but that will be easy enough for you all to pick up if you’re green to the RPG scene. In you are familiar with Tabletop RPG’s, I can say the VAST roleplaying system is Jackson’s homebrew version of the World of Darkness d10 system. Usually, tabletop RPG campaigns happen in the privacy of your own home, and without an audience. But with VAST, you’ll get to be a fly on the wall and watch as the adventures unfolds! But that’s not all! In select episodes, we’ll be farming out tasks to the fans who are watching live. The enterprising fan who first completes his or her charge will stake out a crew position for themselves aboard one of VAST’s starships, and be given an opportunity to interact directly with the players in the future. Fan roleplay is a big element in another project I’m working on called The New Adventures of Peter and Wendy, and I’m excited to bring some of the skills I cultivated there to the table for VAST. And here’s some good news for those of you who can’t stay up late enough on a Monday night to catch the entire live broadcast. I’m not sure just yet exactly how it will work on Alpha, but one very cool thing I’m noticing about Twitch is that it saves the live chat right along with the archived video. And the chat plays out in realtime as you watch the recorded video, so your experience is as close as possible to the live experience when the episode first aired. As you know if you read this blog, I’m a big proponent of using sites like Storify to archive otherwise-ephemeral transmedia content, so that viewers who come to watch the series after the fact can get a pretty good approximation of the entire cross-platform experience as it was originally presented. So from that perspective, I’m excited to see that Twitch has figured out a way to replicate the live experience for viewers who come to the series after the fact. So here’s the deal: The first episode was livestreamed on Monday, 11/7 at 7 p.m. Pacific. That episode lives in archive form on Twitch right now. You have to subscribe to the Geek & Sundry Twitch channel in order to watch the archived videos. It’s ordinarily a paid subscription, BUT if you have Amazon Prime, there’s a way that you can subscribe to the G&S Twitch channel for free. Basically, you can link your Amazon Prime account to your Twitch account, and have Twitch Prime (details here). So in case you weren’t able to watch live last Monday, or weren’t able to stay up late enough on a school night to watch the whole thing, you can catch up on Twitch. The episodes are slated to run about 3 hours, but the first one went a little long, and was broken into two parts. Here are links to Part 1 and Part 2. Getting Twitch Prime set up wasn’t super intuitive, so if you do want to set this up and are having trouble, let me know and I’ll try to walk you through it. Also, once you do have Twitch Prime set up, you should be able to download the Twitch app for your gaming console and watch it on your TV. I know from personal experience that this works on PS4. A friend of mine and I tried it on Roku, but we weren’t quite able to get it working on that platform. UPDATE: I’ve learned the first episode is also now available on YouTube. After the first four episodes, VAST will be a Geek & Sundry Alpha exclusive, which means you’ll have to pay for an Alpha subscription in order to watch. But if you’re at all into this kind of thing, I think you’ll get hooked pretty quickly. Shout out to my super-smart, vastly talented fellow writers Anne Mortensen-Agnew, Rick Baer, Rick Budd, Nick Bragg, Nick Gilman and Isaiah Samson. And everybody in front of the camera is great as well! Read all about our amazing cast here.